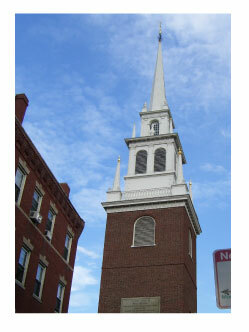 The Boston Photo Gallery 1 has my vacation photos of historic Boston and scenic Boston. Several photos are from the Prudential Building observatory. These were taken in August 2008. This is one of my favorite photos. It was taken in a park-like area near the Christian Science University. 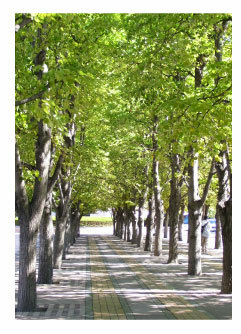 There is a lovely reflecting pool, stone benches for relaxing, and this great line of trees. A beautiful area, near the Prudential center. 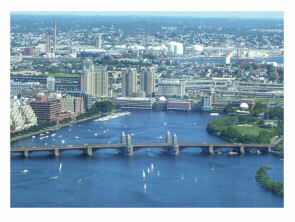 A view of the river, taken from the Prudential Building observatory. It was a beautiful day, with sailboats on the river and the red brick buildings offset with the green leaves and blue water. 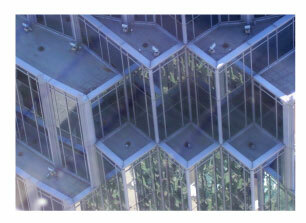 Looking down from the Prudential observatory, this is the neighboring building, with interesting angles and reflections. 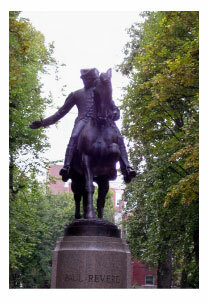 What would a trip to Boston be without a shot of the statue of Paul Revere? It's a great statue, and makes a great photograph.